A little Baseball Indoor Drill black book gives a coach an edge in preparing his team, because he has no control over Mother Nature. Of course the beauty of all indoor drills is they can be utilized outdoors as well, so you need not feel like it’s a Use ‘em or Lose ‘em situation. The main importance of having numerous indoor drills available is to keep the practice fun and interesting as well as instructive. Playing an outdoor sport inside presents a problem for the coach of ….shall we say…a lack of enthusiasm from the players. This is especially true in a non-competitive environment. Trying out for the High School Team vs. playing on a set team which the player knows he’s on, eliminates the nervous anxiety which can be funneled into energy and enthusiasm. Let’s look at some additional drills the coach can call upon if necessary. Short Hops Drill: This drill is intended to teach players how to catch a short hop. Use tennis balls, but preferably hard rubber balls because they are livelier when thrown on a bounce. Preferably divide your players into groups, each to be trained by an individual coach. Spread them out with at least 7‘-10’ between them, facing the coach. In order to field a short hop, the fielder, normally an infielder, must charge the baseball. It is much better to catch a ball on the short hop than back up on your heels and try to catch the ball on the in-between or high hop. Being back on your heels tends to not only pull you off balance, but it makes it extremely difficult to keep your body down (and your glove) increasing the chance the ball will skip under the glove and between your legs. Even if you’re successful at fielding the ball you’ll be back on your heels which will force you to set, then crow hop towards your target, or throw using only arm strength. Either event will take more time to perform or result in a slower throw. Chances are the runner will beat the throw and be safe. 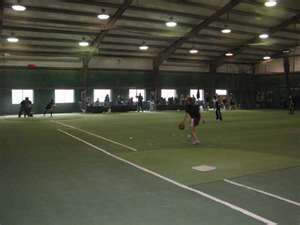 Using the rubber ball (tennis) and standing @ 20’ away, throw short hops to the fielder. Mix the throws up, throwing to the player’s left, right and right at him with varying degrees of speed. Don’t allow him to begin cheating one way or the other. Station a 1st baseman for the fielders to throw to. Should lack of space be an issue, have the fielders throw softly to the fielder. 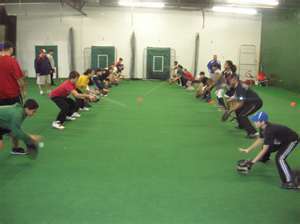 The important part is the fielder is required to field and complete the throwing motion in order to complete the put out. Pick Off Moves: This is a two fold drill which addresses Pitchers developing their pick off moves at first base and runners learning to get a good jump off the pitcher, while not getting picked off the base. Place a pitching rubber and a rubber 1st base on the floor in a manner and distance similar to a real life scenario. Position your pitchers together, have a catcher, a first baseman and have the remaining players single filed at the first base area. Have each pitcher practice their pick off moves. This includes their move to first base, their move home, their staggering of time in the stretch position. They should throw home from their regular stretch motion and their slide step motion. Everything they would do in a real life scenario, they should practice at this time. The base runners should practice their lead offs, both initial and secondary leads. Their diving back to the base, their cross over step, everything they would be doing in a real steal situation. 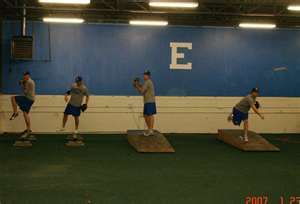 By creating competition between the pitchers and base runners you will enhance the intensity of the drills. As the coach you should be monitoring whether the pitchers are balking, correcting or improving on the pitchers move to first and or move home. The runners should be coached on improving their lead off, proper balance and foot work and the proper dive back to the base form, one step, dive and reach for the right field side of the base. The first basemen will also gain experience on holding runners on base, then retreating quickly to their fielding position. The catcher, although not throwing to second base, can work on his positioning with a runner on first base. The intensity and drive in which you, the coach, place into this drill will dictate its effectiveness, but performed properly, it’s an intense learning experience for the entire team.